Hello and happy Monday to you! I'm just back from the feed store; it's time to switch Penny and Betty to layer mash, or chicken food for grown-up chickens. The feed store is about fifteen minutes away, in a more rural area. The small Bears were with me. They love to ride in the car. Do your kids like car trips? Mine always did, even as little babies. Now, they entertain each other in the backseat and sing along with the radio. I mostly listen to "mix" and classic rock in the car. They know a lot of songs! We're home now, hanging out in the family room, and I'm watching roofers work on a house across the arroyo. My garden wall obscures the house they're working on and it looks like they're walking in mid-air with the mountain behind them. It's freaky. The garden is looking fantastic now that we're in the monsoon season; all the later-summer flowers are coming on like gangbusters, especially the hibiscuses and roses of Sharon. The coreopsis, one of my favorites, is blooming now too and the apple tree is practically keeling over with the weight of this year's crop. I can't wait until they're ripe. Just a few more weeks...and I might have fresh eggs by then too! 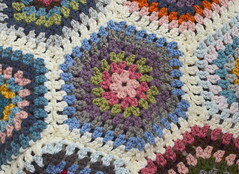 Thank you so much for the wonderful comments on my flowery circles and the start of my flowers in the snow blanket. I'm really enjoying the work, especially now in the joining phase. By the end of the weekend, I had four rows joined. That's one-fourth of the blanket! It's easy to pick it up and join a few squares here and there. The blanket is growing fast. The joining felt a little fiddly at first, as I got used to holding the work and crocheting around each circle, but I feel pretty confident with it now. Gosh, I love to crochet. When it's going right, it feels so good. 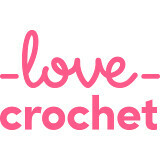 My next big crochet project is already in the pipeline - a big, mindless-crochet afghan for the family room. I've been collecting the yarn, a few skeins at a time, all summer. I have some smaller pieces planned too; I want to make myself a cowl or two for the winter and maybe try a little sweater for the GB too. Maggie Rabbit is on the back burner for now; I may give her to the GB for Christmas instead of her birthday in September. It won't hurt to have a few more months of maturity before I give her such a special lovey, and besides, I really like working on this blanket. I'd like to crochet something else for my LB soon too, but boys' patterns are a little harder to find. He would probably wear a crocheted hat, but I know he won't bother with a scarf; too many important things to do! Boy-crochet suggestions are welcome. I want to share something really cool today. The Bear has been making time-lapse videos of our view of the mountain this monsoon season. He does this with his Raspberry Pi computer, which is fitted with a camera called a Pi Cam. The Bear and the LB love to work on these devices together and they built the computer (which we call "the bot") over the past few months. The Bear put it in the window of our family room, facing east toward the mountain, and had the camera take a photo every six seconds from 10:30 AM until dark. Then he compressed all the photos into a time-lapse video. On it, you can watch the clouds change throughout the day, and you can see storms roll through during the afternoon and evening hours. He made several of these videos, each depicting a different day. He put them on YouTube but I'm sharing just one here - we think this is the best one. It was taken a week ago, on July 14. We had a lot of fun with it. And you can see what we see on a typical day in glorious monsoon season. That time lapse is quite incredible, the different directions the clouds move in and the light and shade on the mountain. And I loved the plane going through! Wow, that video is so cool! It's like the clouds just keep getting burned off by the sun for a while, then the wind picks up and they roll in really fast. You must get some great cloud-spotting in New Mexico! I love the way your mountain lights up in the evening sun, too. What a cool video1 It was fun to watch the clouds! Clouds roll! They really roll! I've watched this three times no, once with Alfie. I couldn't take my eyes off the clouds the first time. The second time I noticed the different light, especially your garden wall. Time lapse looks really cool to do. I have often thought it might be good to station it somewhere in our house and record the coming and going of the family. Wonderful! By the by, we are on YouTube under Leanne Paxton, I think. Marc and the boys made spoof cop shows (i do a small cameo), and the year that I was pregnant Marc and I made a film called the Christmas Quest. Every member of our family here in St Ives were in it. The script was completely plagarised from famous films and tv shows, no-one saw it until Christmas Day after we had all eaten and opened our presents. I think it's split into segments. (there's also loads of dreadful stuff from Sam, but hey ho). I can't wait to see if you make any more time lapse films! It was so interesting to watch those individual clouds form, join up, change shape then dissipate. Well done and thank you to your Hubby and LB! Good to hear the chooks are progressing, lovely to see your flower pics, and I'm so happy for you that the apple tree has recovered so well after all the concern it caused you. Lovely post again thank you Jennifer. The video was beautiful to watch. How great that your Hubby and LB have projects they work on together. Those moments will make great memories for when the children are older. Trust me in this. As for car rides our kids loved to read in the car. On long trips they each packed a backpack full of books and had most of them read by the time we returned home. It sounds like the blanket is coming along very quickly. I'm looking forward to seeing it all done. The circles were sure beautiful. Thank you for the sweet comment on my blog today. I appreciate you. Really. What an amazing video, very impressive. Have a great week. Thank you for your visits and lovely comments it really is appreciated. That video is intriguing ! I just couldn't stop watching it !! Oh wow I love your video Jennifer, the changes in the clouds are amazing and boy does that sky get angry at times!!!! That's amazing how the storms roll in. I love how the mountains change in different light, and the shadows which the clouds cast on them. What a great video, what a fun thing to do. I always find watching the sky fascinating, watching the time lapse video was really good. The flowers in your garden are really pretty especially the first flower the poppy. I especially love the first flower picture, Jennifer, and the video clip is very impressive. I'm glad to hear the joining of the blanket squares is going well. I must confess that when I saw all those beautiful squares I wondered if it might take longer to sew them to gather than it did to crochet them. I'm glad for your sake that isn't turning out to be the case. My Maggie Rabbits have also been in hibernation. Yesterday was Lucy's birthday, and one of the rabbits is her gift (to be placed on the dresser in her room until she is old enough to play with it), so I really need to get going on them again. My kids have always enjoyed riding along in the car. They sit together on the back seat holding hands and singing along to the radio. The video is awesome! So interesting to see this kind of natural phenomenon. Your husband is a talented guy to fix up that camera and record that wonderful video. Glad you are having fun with your hook in your hand. What a great video! New Mexico looks like such a beautiful place. I hope to visit some day! The apple tree is looking great.. I look forward to the day that I ty my hand at growing something edible in the garden. Your video is amazing Jennifer....you do live in such a beautiful place! 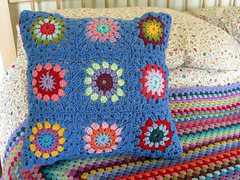 I'm catching up after my break and have just seen your flower circles too in the last post....so pretty...your blanket will be stunning! That video is amazing - I loved watching it. Looks like your apples are much further on than ours - ours won't be ready to pick until September or maybe even October. I'm sure you can't wait to get eggs - they'll be delicious. As for crocheting for boys - well boys like blankets too. Use good 'boy' colours - maybe even make the blanket look like a flag. Beautiful photos of your dazzling flowers, Jennifer! Your hubby's time lapse of the clouds is amazing! Enjoyed viewing the drama! The stop motion is brilliant! That video was awesome! I love watching the clouds move and change and even how the yellow wall changed colors, depending on the light. WOW!!!! That was sooooo coool!!!! Love to see the clouds moving in and the wind blowing the bushes and trees!!!! Your Bears are soooo clever!!!!! Have a fun weekend!!! As always your photos are lovely, Jennifer, but this time the highspot has to be the Bear's time-lapse video. I sat there fascinated and loved every second, especially when the clouds appeared to break over your house like the best kind of surf. Wonderful!